MAN Truck ... improved efficiency. MAN Truck & Bus has launched its new generation telematics solution, MAN EcoStyle, with its partner Microlise. The system has been designed to help transport operators improve driving standards, reduce vehicle wear and tear, enhance safety levels and improve vehicle health, as well as reduce overall operating costs, emissions and fuel usage. 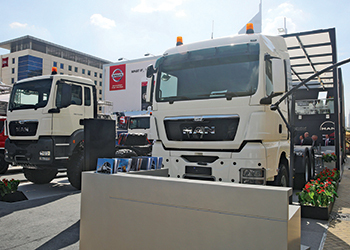 “The new telematics system has been developed for the Middle East market and it helps improve fleet performance,” said Franz von Redwitz, managing director of MAN Truck and Bus Middle East. He further said: “What sets us apart from others is our expertise in meeting the varying transportation needs of the construction industry, including special application vehicles. Another new product from MAN is the Euro 5 TGX 6 by 4 tractor head which is not only greener but also more powerful with up to 540 hp, he said. With a gross vehicle weight of 33 tonnes and gross combination weight of 180 tonnes, it is designed for heavy transport requirements of the construction industry, whilst being equally capable catering for the specific demands for long haul operations. “The MAN TGX represents the future for the Middle East and has already been fully adapted for the local market,” said von Redwitz. The new solutions were displayed along with other existing products at The Big 5 show in Dubai last November. The company last year marked its 100 years as a globally recognised commercial vehicle manufacturer. The company also showcased MAN’s ProfiDrive training model. It is a specialised training programme, designed to raise the level of knowledge so that drivers can adopt the best driving practices for the prevailing road or traffic conditions. Through a ProfiDrive training seminar, drivers learn predictive driving techniques such as how to recognise dangerous situations, calculate the optimum stopping distance and evade obstacles that suddenly emerge. MAN has been providing the service to its customers in the Middle East for on-road operations since 2009 and is now also offering an off-road training module to cover all aspects of truck operation in the region.